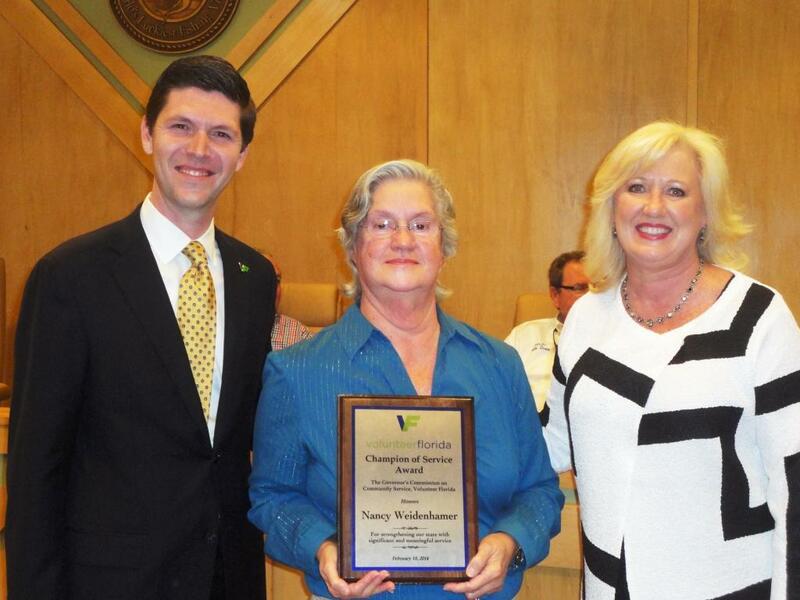 At the Feb. 18 city council meeting in Destin, Mayor Sam Seevers and Volunteer Florida CEO Chester Spellman presented the Volunteer Florida Champion of Service Award to Nancy Weidenhamer, who has been improving the Destin Community in a variety of ways since 1990. Weidenhamer began volunteering locally by teaching literacy to adults, and has also helped to generate positive changes in the community by establishing the Destin Community Land Trust, a nonprofit dedicated to empowering the Destin community through volunteerism. In addition, she chairs the Public Works and Safety Standing Committee and is vice-chair of the Harbor Community Redevelopment Agency (CRA) Advisory Committee. Weidenhamer’s most recent volunteer achievement includes the completion of Destin’s first dog park. She led a team of 30 supporters and collected over $38,000 to make the dog park possible. She continues to raise funds for additional improvements to the dog park and does whatever else she can do to improve the Destin community. Mayor Seevers was appointed by Governor Rick Scott to serve on the Volunteer Florida board, also known as the Governor’s Commission on Community Service, on November 8, 2012 for a two-year term. The Volunteer Florida Champion of Service Award honors individuals and groups for their outstanding volunteer efforts.